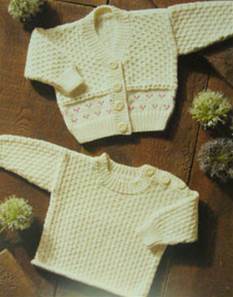 Cardigan/ sweater: 31cm 100g, 36-46cm 150g, 51-56cm 200g. Based on 50g balls cotton blend DK. Tension 22st / 30 rows to 10cm, 4mm needles.